After years planning, praying, giving and constructing, the Social, Medical & Training Centre was officially opened on Sunday 20th September. 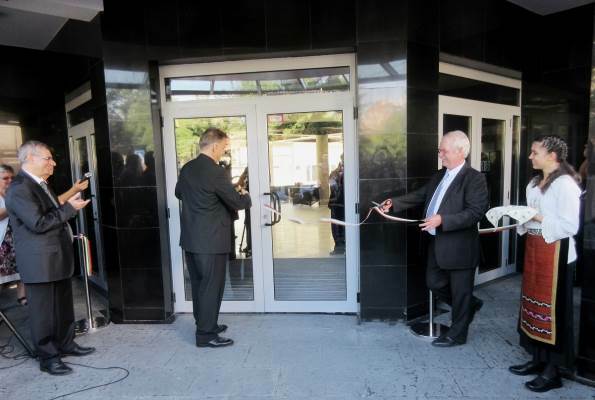 Sixty supporters flew to Sofia for three days of celebrations and the Official Opening with a tape-cutting ceremony at the entrance of the new Centre by Tedi Oprenov, Pastor of Sofia Baptist Church and Geoff Wallis, Secretary of the Trust. A four-hour dedication event followed with greetings from many organisations, a message support from the Mayor of Sofia, presentations by children and other groups in Sofia Baptist Church, accompanied by lots of wonderful music and singing. An international Baptist Congress followed, attended by the President of Bulgaria, Mr. Rosen Plevneliev who gave a friendly welcome and complimented the Baptists on their humanitarian work in Bulgaria over the years. The President’s attendance was a particular honour reflecting the importance he places on the work of Evangelical Christians and the new Centre.